Rob fed us with hot porridge doused in maple syrup, opped with fresh fruit, and Claudia furnished us with clear instructions…stay on the 138 north. Both contributions set us in good stead and we had a great ride along the St Laurence, flat roads and pretty countryside. Our first night was in a tired old campground right on the river. A crackling fire, meat sizzled over hot coals and a nice glass of red makes up for many a shortcoming. Google maps told us a sodding great lie next day which we were first alerted to when we stopped to chat with a couple of cyclists. I’ve mentioned this before but it’s worthy of repeating…nothing is a sure thing until after the fact – nothing! So the situation was that Google told us there was a campground at a certain location. The two cyclists looked at the map and said, ‘there’s no campground there, that campground is here.’ and they pointed to a spot 20km further on…we were already up for 90km. To take their word for it or not, that was the question. We opted to proceed into Trois Rivieres and check at the info centre – far from a watertight source of good information but that was our plan. En route we stopped again and chatted with a guy who spoke fluent English. He confirmed what our cyclists 10km back said. Hmm, by now we were just 5km from the info centre so we continued on. Maybe they knew about a campsite that wouldn’t tack 20 km onto our ride. Finally we arrived at the info centre to have our suspicions confirmed, google maps got it all horribly wrong. We consoled ourselves with coffee and a cinnamon roll. Then the lady at the info centre told us about a campsite only a few kms away that we could probably stay at if we arrived before 5pm. Our spirits lifted and we dashed off to make curfew. Under different circumstances this may have been a lovely place to stay, but it was essentially closed for the season and there were no firepits or any other amenities. Once you’re asleep it doesn’t matter so much so we counted our many blessings and soon enough the sun rose again and we were out of there. 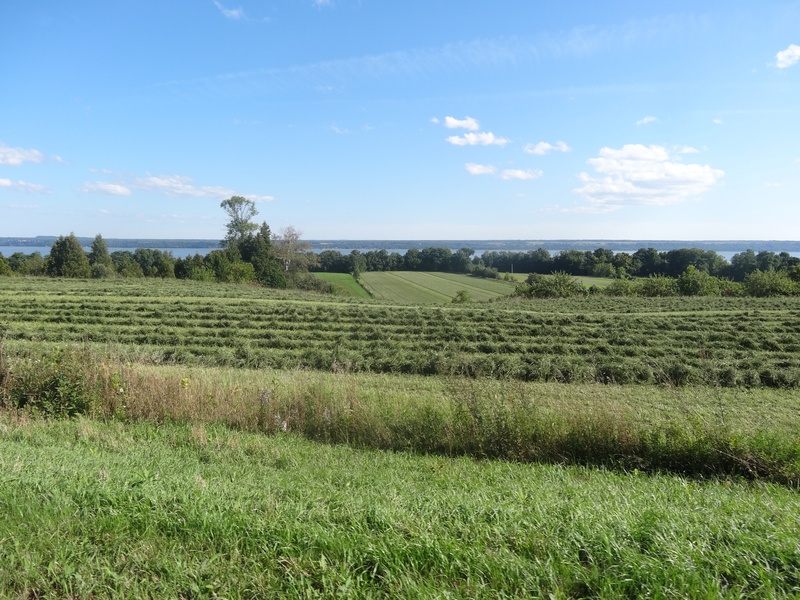 Apple orchards, cornfields and the ever present St Laurence river accompanied us the next day. Little hills began to appear and the next day, as we approached Quebec City, we were back into rolling hills. 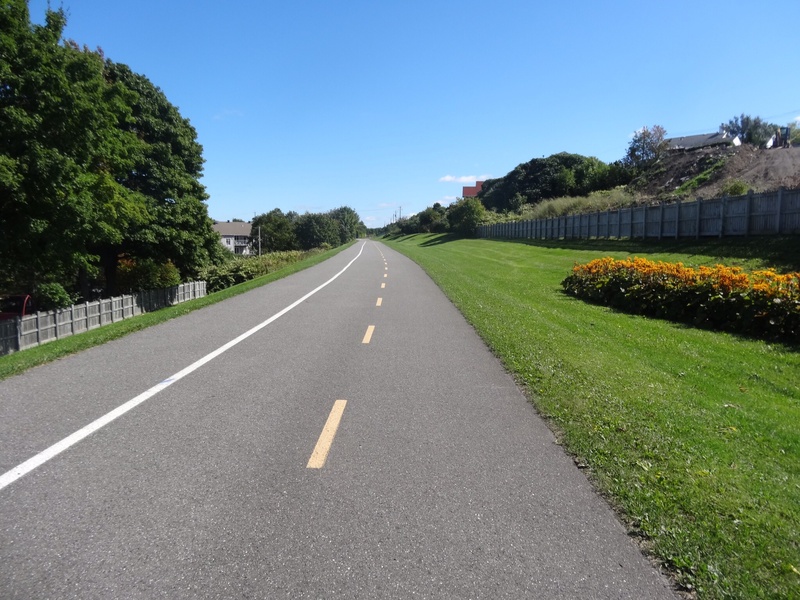 Arriving in Quebec City was a cinch, and the extensive cycle ways in Quebec – over 5000km – are fantastic to ride on. No ATV would dare tear up these pathways, and many of them are sealed anyway. Quebec is really big on cycleways. Route Verte paths like this are all over the state. However we ran into navigational issues yet again. A helpful English speaking lad on a bike asked where we were going. He then proceeded to guide us for a few kms, then stopped, pointed across the road and said, ‘there’s the campground.’ It was very nice of him, the only problem was that it wasn’t the campground we were looking for and this particular one was closed for the season. We found that out once we reached the bottom of a long, rough. Another guy who spoke a bit of English saw Grieg and I conferring and came to assist. He discussed our situation with his wife who spoke no English and soon others joined in. This turned into 20 minutes of us standing by while an ever expanding group discussed our problem…all in French. It was clear that everyone had a vague idea but no one knew anything for sure. Soon another chap joined the conference and with a few decisive words all was resolved and successfully translated to us. Off we went with right directions and FINALLY made it to our campsite. This has been a recurring theme throughout the past two and half months…a great day on the road, stress rising as we struggle to find our campground (there are so many different reasons for this… there’s road works, it’s closed for winter, it never existed, the signage was wrong, bad instructions and of course our own errors) then relief, humour and gratitude as we settle in for the evening. Quebec City was so worth the effort and since we’d ridden right by it to reach our campground, finding our way back there next morning was a breeze. We parked our bikes and walked through this gorgeous old walled city. The Quebec Grand Prix comes racing by. Poutine…we finally tried it after years of resistance. Crispy roast potatoes with pulled pork, caramelised onions, cheese curd and gravy. Very delicious! Leaving Quebec City was straightforward enough but we encountered another greeble in Google maps and what started out as an easy day turned into a wet, protracted day, saved by a nice young lady who told us about Google’s error and pointed us in the right direction. We arrived at St Apollinaire cold and miserable and were greeted by a woman of similar disposition. ‘Parle vous Anglais?’ we inquired. ‘No,’ she snapped, followed by ‘Its $40 for a tent.’ The shower was extra and we couldn’t light a fire since it was pouring with rain. We raced off to have showers and were met with our least favourite option. What depraved mind conjured up the idea of a shower with a set temperature and an automatic shut off after an unspecified time? We dropped into bed at 6.30 with hot soup and red wine while the rain bucketed down upon our trusty tent. At 11.30pm it finally stopped, we got up, ate yoghurt, drank hot chocolate and went back to bed, happy in he knowledge that we’d be departing in a few short hours, never to return! The next day we found ourselves on a deserted gravel road and wondering if Google had shafted us again. But after a while, gravel became bitumen and Google redeemed themselves. It’s an excellent resource, but not without it’s problems. We were warmly welcomed in St Rosaire by a lovely lady who delivered a gigantic load of firewood to us, along with sympathetic comments due to the chilly forecast. We really liked it here and decided to stay an extra night. In the morning a friendly visitor and her dog arrived. Joanne was very curious about these two people, one tent, no car…questions needed to be asked! She invited us over to her RV for coffee and at that point discovered we were staying another night. ‘Well, you will come for dinner then.’ she announced. We had a great evening together and feasted like royalty. Like most campgrounds, this one will close in a couple of weeks, re opening in summer. All the permanent tenants up and move somewhere else. Joanne, and many others, will spend the next six months in Florida. 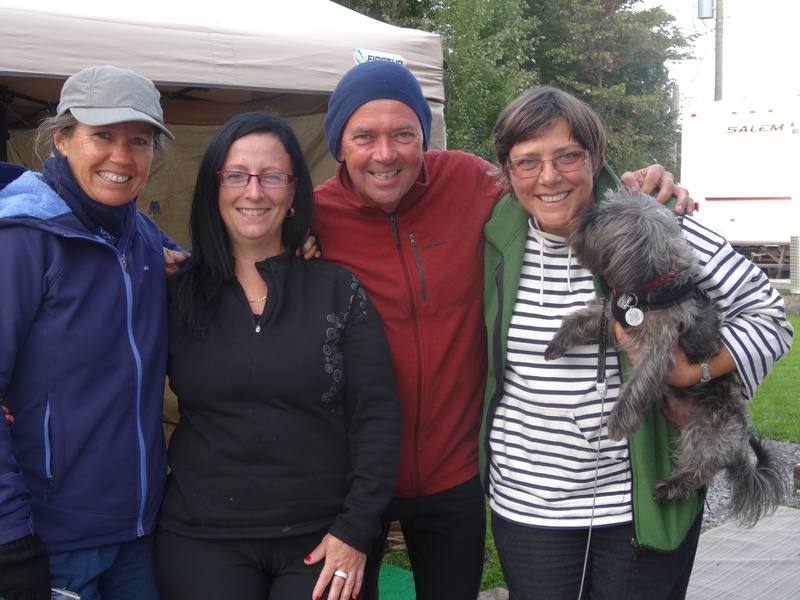 Us with Gilene (neighbour), Joanne and her lovely little hound Kaapeh. 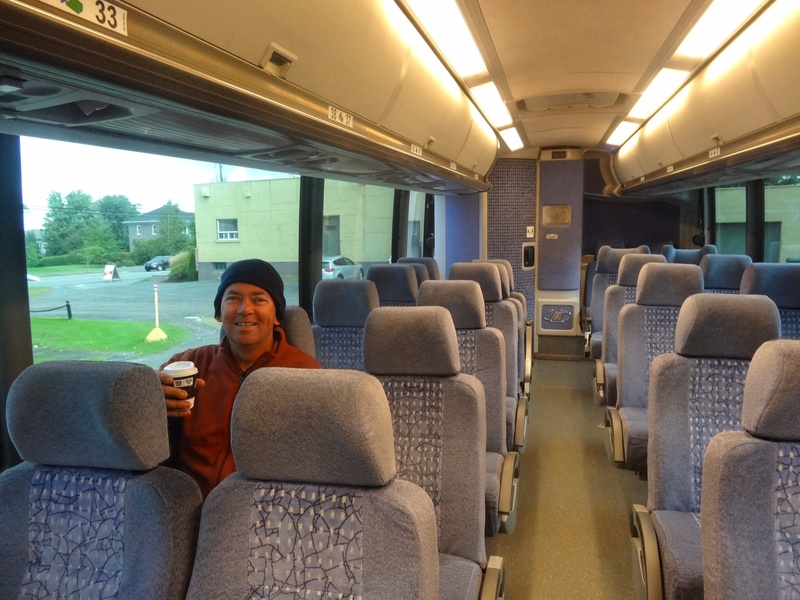 Next morning we jumped on our bikes for a short ride into Victoriaville where we caught a bus to Sherbrooke. Ahhh luxury, a bus to ourselves for an hour and a half. The easy and dry way to Sherbrooke. We’d arranged to stay at an airbnb for a couple of nights in Sherbrooke. Matt was our host and he knew all about the city, where to go, what to do. We ended up staying with Matt for an extra day. Sherbrooke is a uni city and Matts place was right in the heart of it…restaurants one way, cycle paths and a lovely lake the other. The delightful Matt! Sadly we didn’t get to meet his GF as she was working in Montreal. Lac de Nations, Sherbrooke. A lake of many functions including water skiing. Great place for an evening stroll. Classyco, a Mauritian concept restaurant…lovely evening here. We visited a quaint town nearby, notable on two accounts, 1) it has the oldest microbrewery in Quebec and 2) they’ve abandoned the status quo and speak mainly English! Unlike the entire state of Quebec, this tiny town has signs in English, and it’s the more common language to hear on the street. I’m pretty sure they’d be despised by the fellow Québécois. We farewelled Matt, very grateful for his fine company, excellent coffee, and lovely place. Surely we shall meet again! 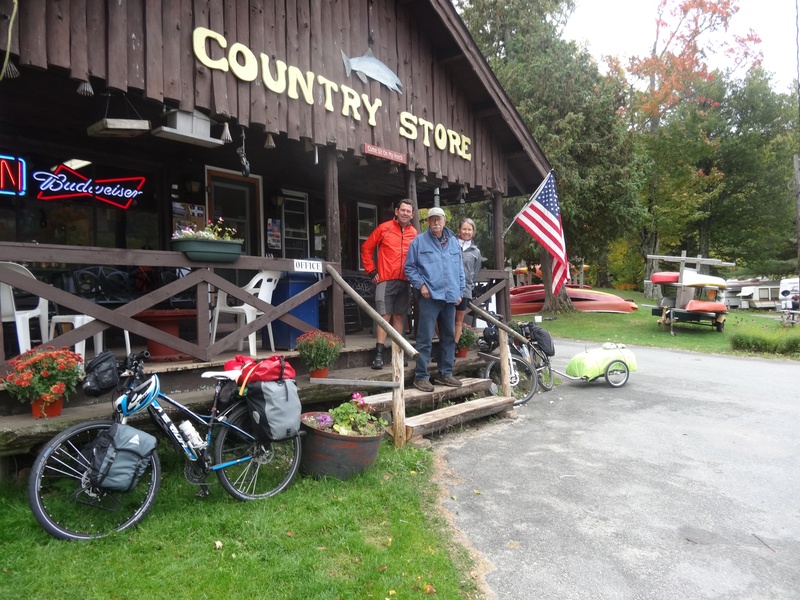 Next day we struck out for Stanstead, pedalling south for our last full day in Quebec. No one could be found when we arrived at the campground so we had the pick of the sites again. Later, a little sixty something lady stopped by and was somewhat alarmed to see our tent. She was the owner and once she recovered from the disappointment of us not being able to speak French, she told us in broken English that frost was forecast. She delivered an enormous load of wood for our fire, then invited us to stay in her house! Incredibly kind, but we declined the offer and had a cosy night sleep again since it’s really just a case of putting on enough layers. The frost didn’t eventuate and we packed away the tent next morning for the last time in Canada. After just ten minutes on the road we were at the border. This seemingly routine procedure turned into a debacle when it transpired that my passport wasn’t stamped when we entered the states in NYC. We were asked to park our bikes and come inside where the bureaucratic wheels of border security once again groaned into action…maybe there was a red mark against my name for the misdemeanour of trying to smuggle contraband in a few weeks back. Bureaucracy by nature is an inefficient beast and after too many questions and too much computer tapping, I said the the officer in some frustration, ‘with all due respect, it’s not Australian cycle tourists you need to be worrying about.’ To which he replied, ‘could I tell you a thing or two…our biggest bust right here was two 76 year old white Americans, a man with drugs, a woman with cash.’ Touché! Finally we were released into a howling headwind that persisted all day – back into the land of the ubiquitous national flag. White Caps campground charmed us with so much welcoming street appeal. A little sign over the steps invites guests to, ‘come sit on my porch.’ We did that quite a bit. Us with Doug at White Caps Store. The weather forecast was rain and wind for the next two days followed by a week of fine weather, so the question was, ‘shall we stay a couple of days in this hitherto unheard of spot with no nearby services? Or shall we ride through dismal weather and keep heading south.’ We dragged our heels until the decision to stay was made by default and on the second and third nights we stayed in a tiny, absolutely delightful little cabin. The forecasted rain was nowhere to be sen so we donned our hiking shoes and walked up nearby Mt Pisgah. This was a magnificent bonus, a short sharp hike of two hours that yielded incredible views over Willoughby lake and the magnificent forests of changing colours. The next day Doug lent us his car so we could go fast paced sightseeing in this amazing area, world renowned with ice climbers we were told. Doug lent us his car to take at look around the area. Our cabin at Lake Willoughby for two days. We were witnessing the autumn foliage coming into its spectacular array of colours. It’s a truly incredible experience to see a landscape of trees burst into an inferno as they prepare to close down for winter. Our next destination, the Mooseriver Campground in St Johnsbury was an easy ride south, and unbelievably beautiful. We’d ride around a bend and both stop on the side of the road to gaze in astonishment at the trees. I don’t have words to describe how beautiful it is, or photos that do it justice. That evening we sat around the fire with some fellow travellers who have sold their family home and hit the road indefinitely. I was amazed – after almost three months on the road we’re very excited about coming home to all that we love in our part of the world. Selling up and moving constantly? No thanks! With Dan and Sandi in their home away from home. 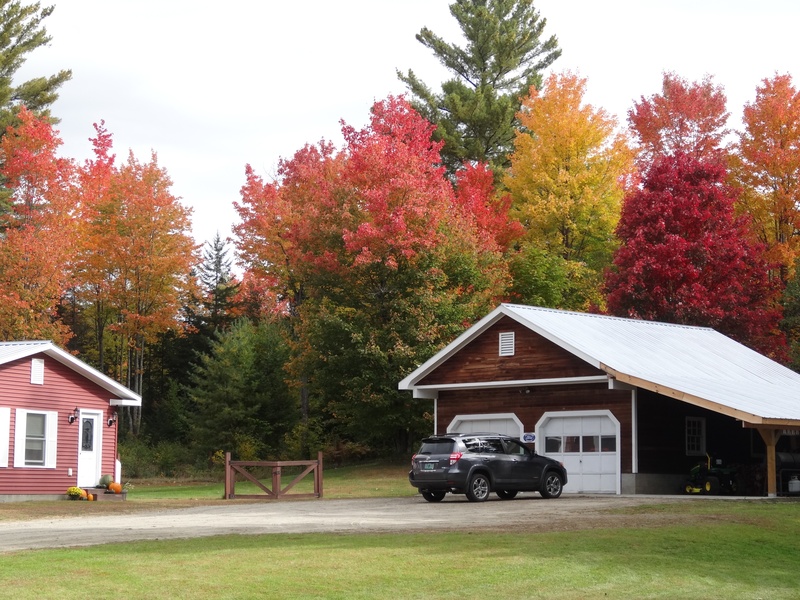 Harvest festivals and Halloween decorations at every turn…even Mooseriver Campground. Next day we rode through more incredible scenery and on to the home of our ‘warmshowers’ hosts, Dave and Julie. It was tough getting to their place, a beast of a hill that she warned us about, but sooo worth the effort. A sign on the door welcomed us since they were out and about. These guys were great to be with and we had the extra treat of a couple of dear hounds. Dave cooked a delicious dinner but the real coup was his breakfast offerings…homemade pancakes with homegrown blueberries, heavily smothered in local maple syrup. No wonder we’re not fading away. Tuition in hand gun shooting! It was hilarious because the gun was so untrue and Grieg was missing from 5m away. He’s a really good shot any other time. We discussed our plans with Julie next day to ride to Lebanon, about 70km away (44 miles to an American). ‘Lebanon,’ she exclaimed, ‘you’re only going to Lebanon?’ We were greatly amused, she’s an absolute machine and takes cycle tours all over Vermont. She would hardly rate 70km worth getting out of bed for. Hopefully she will come visit us in Australia, Dave has flatly declined the offer due to it being too far…though he’s off to Scotland shooting in a few months! So we did our little ride to Lebanon which was enough for us, especially when we had trouble with our directions again. People constantly amaze us with how nice they are though. A woman on a bike saw us looking stranded and pulled over to see if she could help. She then lead us to our destination and asked if we needed somewhere to stay because she has a spare room! Amazing huh. We did have a place…another warmshowers host. Scott cooked up a storm for us and we had a lovely evening with him. At this point our southbound riding was beginning to outrun the foliage that we so love and want to continue watching, so we discussed the idea of slowing up. Scott told us of a whole bunch of things that we could see in this area, on the border of Vermont and New Hampshire. So next morning we packed up and left for Quechee, just 30km away. We set up camp and stayed in this great spot for two days, visiting local towns and enjoying the season as it unfolds. Scott recommended a fantastic market, and as we were strolling through we heard a familiar voice…Scott’s arrived! We spent the afternoon with him and came up with the plan to go back to his place for two more days. 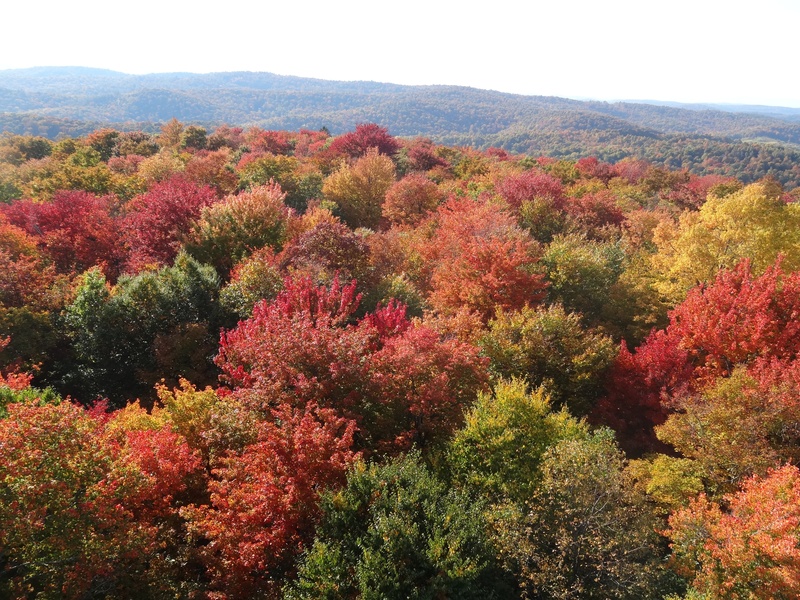 This gave us a big chunk of time to enjoy the foliage changing – there’s an official name for people like us, leaf peepers! Dartmouth College is right here too and we spent a full day enjoying Hanover, the town associated with this Ivy League institution. It has a vibrant atmosphere, with crowds of young, confident, beautiful people getting set up for their lives. Several times we came into contact with students during the days we were there – friendly, interested young people, curious about our cycle trip and faraway Australia. 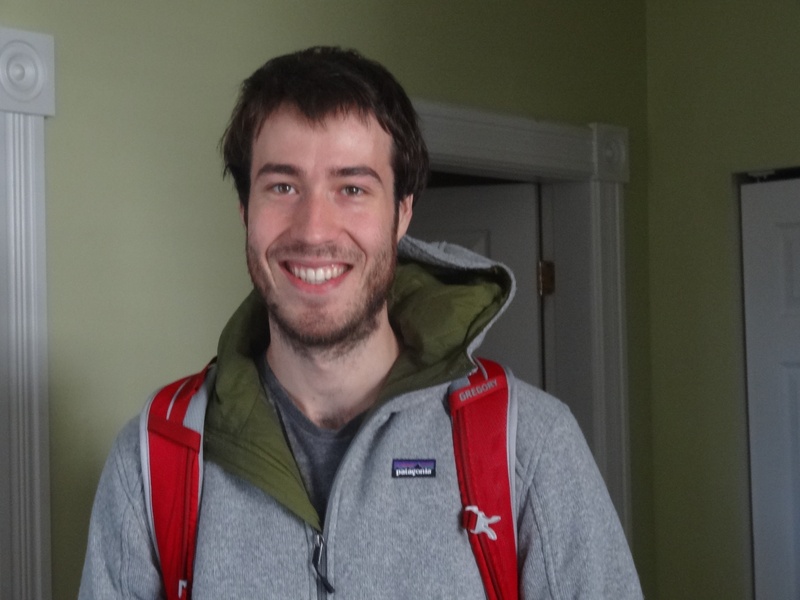 Woodstock – not THE Woodstock, but a very neat place in its own right. 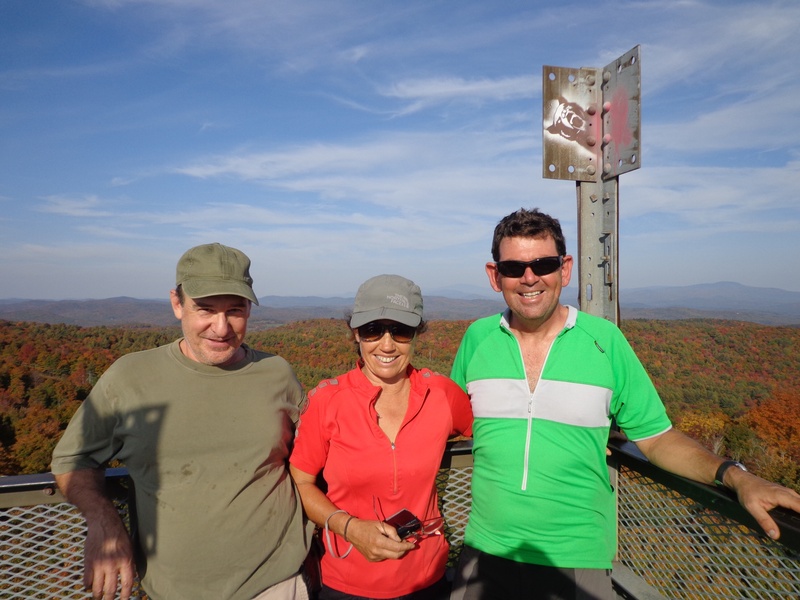 Scott took us to Gile mountain where a short hike lead us to the old firetower from which we had 360 degree views of this magnificent sight… one of our top of the top highlights of the past three months. Wth Scott who brought us to this incredible lookout. October 3, 2014 in Uncategorized. Such a rich feast, this blog has been. We’ve enjoyed the relationships, the photographs, the great descriptions and comments. Thanks guys, and we ‘re hugely proud of you for the adventure you created and shared together. Thankyou for sharing your story and your travels. You’ve given us some laughs and some not so good recommendations. I think I’ll stick to cycling in Europe. See you soon. Glad you’re home safely.